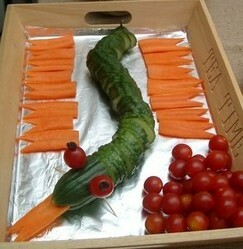 This cucumber snake with carrot snake tongues is great fun for a kids birthday party. The cucumber snake was a success with the kids. The cucumber actually got eaten which the parents appreciated. Kids can have lots of fun with the carrot tongues pretending to be snakes. This cucumber snake is very quick and easy to make. It should take about 15 minutes to make and is lots of fun for the kids and it's even healthy. Prepare a plate or tray for your cucumber snake. You could curl him around a round plate. I just lined a tray with foil. Now cut a 3" head and 3" tail off the ends of your long cucumber. Slice the middle of the cucumber into slices. Arrange the snake in a wiggly pattern or a circle. Take two small cherry tomatoes and two raisins. Use wooden food picks to skewer a tomato and a raisin for each eye and stick them in place on the head of your cucumber snake. You might need to use a couple of extra food picks to balance the head. Peel your carrots and chop the ends off. Now cut them into long rectangular slices. Cut a triangle out of the end of each slice to make a snake tongue - they don't all need to be identical. Now cut a slit in the cucumber snake head and pop a nice long snake tongue in. Arrange the rest of the carrot forked snake tongues around the cucumber snake. If snakes or reptiles is a major theme for your party then you might want some other snake-themed party food. You could bake snake cookies, or cheese biscuits for a savoury version. Anything long and wiggly can pass for a snake! Or your could choose a snake cookie cutter. And of course gummy snakes are a classic. Kids will have lots of fun with long gummy snakes and small bags can be given as party favors. Bright green party supplies work well with a snake or reptile themed party. This range has lots of matching party supplies in fresh lime. You can buy them in a party pack or choose individual items separately. The cucumber snake would look very at home here! Did you like the Cucumber Snake Party Food? What a cute idea! I'm always in need of new ways to tempt our little guy to eat because of his autism. He will probably have as much fun creating this as he will eating! Hi Terri, I love this idea! I don't have kids but when I do, I'll try my best to get them to eat healthy... This even looks like a fun idea for adults! Okay, you really meant a snake party. I thought it was code for something new. Great idea for my nephew. Will pass along. Thanks @kinworm. 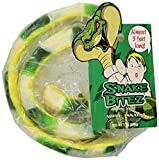 I wasn't sure if the kids would actually eat the salad bits or just play with the snake. But it got devoured! That snake party food looks like so much fun - my daughter would love this! She loves raw carrots, cucumber and tomatoes so that's a perfect combination.